The Global Compact is a UN platform uniting the private sector to promote corporate social responsibility and transforming globalization into a positive force. The Bulgarian Global Compact Network has contributed to the achievement of the UN Sustainable Development Goals for five years now and is one of Europe’s fastest growing networks. By 2019, at a global level, the UN Global Compact brings together on a voluntary basis over 10 000 companies and over 3 000 business associations, non-governmental organizations, academia and cities from over 160 countries in a network for exchange of best practices and cooperation. 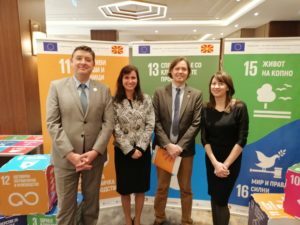 As a leader on the Balkans, the Bulgarian network shared its experience with the Macedonian network during the „Conference on Global Objectives for Local Sustainability“. The event was held on 14 March in Skopje and was the final stage of the project ‘Building cross-sector partnerships for sustainable development’ financed by the European Union and implemented by the Macedonian organizations Konekt and Agora with the special participation of the Bulgarian Global Compact Network. 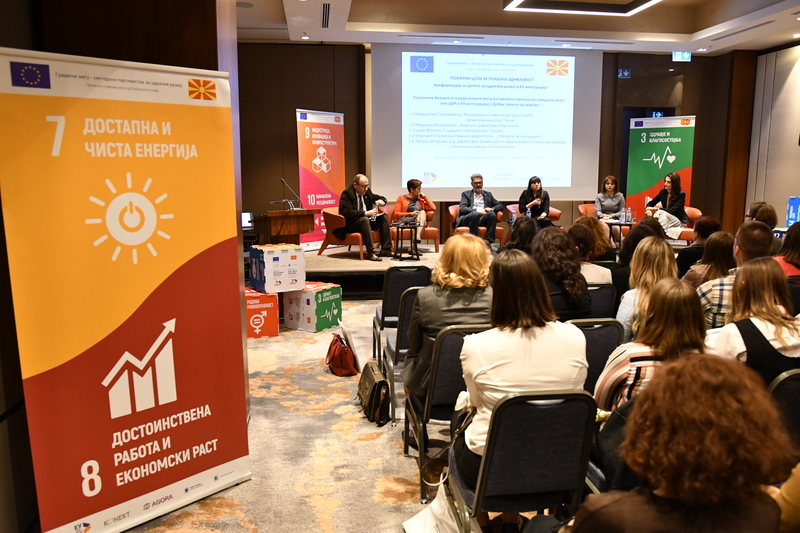 By participating in this project, the Bulgarian network has helped the Macedonian network to effectively integrate the Sustainable Development Goals. ‘Sharing knowledge and experience enriches us. The Global Goals unite us for achieving a better future, not only for nations and companies, but also for every individual person. They give us the opportunity to work together which is always more efficient, meaningful and satisfying‘, said Darina Georgieva, Executive Director of the Bulgarian Global Compact Network. Konekt’s Executive Director, Nikica Kusinikova, shared her satisfaction with the joint collaboration with the Bulgarian network and stressed that cooperation helped establishing a significant cross-sector dialogue and commented on the fundamental role of the Sustainable Development Goals in promoting business as a driver for positive societal changes. ‘To me it was a pleasure to work with the Bulgarian Global Compact Network. Thanks to our partnership we have been able to promote sustainable cross-sector partnerships for sustainable development. In the realization of the project, our Bulgarian colleagues shared with us their experience in working with local businesses and stakeholders as well as the methods by which we can successfully apply these good practices‘, said Ms. Kusinikova. The Head of the European Union Delegation to the Republic of Northern Macedonia, Nicola Bertolini, underlined the commitment of the European Union to actively support the country in the successful implementation of the UN Sustainable Development Goals. He also said: ‘The Sustainable Development Goals are an action plan dedicated to people, to the planet, and to prosperity. The European Union is strongly committed to this plan and we hope, through our help, to manage building good cross-sector partnerships thus spreading the awareness on the debates concerning education and the environment. What we are trying to do is turn the Global goals into local solutions that can respond to dynamic societal changes and people’s expectations‘. The conference was attended by some of the leading companies in the Republic of Northern Macedonia, the Economic Chamber in the country and the civil organization „Open the windows“. Steve Kenzie, Executive Director of the United Nations Global Compact Network in the United Kingdom, and Benjamin Perks, UNICEF and UN Representative for the Republic of Northern Macedonia, were also present. ‘Politicians must think about the future generations. Today, cooperation is considered a global structural and peace policy. It aims at helping to cope with crises and conflicts in a peaceful way by encouraging the conservation of scarce resources and above all, the protection of the environment for the next generations, thus contributing to the reduction of global poverty‘, said Deputy Minister of Foreign Affairs of the Republic of Northern Macedonia, Andrey Zhernovski. As a result of the successful joint partnership between the two local networks, a specialized manual for collective actions on the implementation of the Global Goals, with which the Bulgarian network shares its experience, has also been released. The guide will soon be available online.